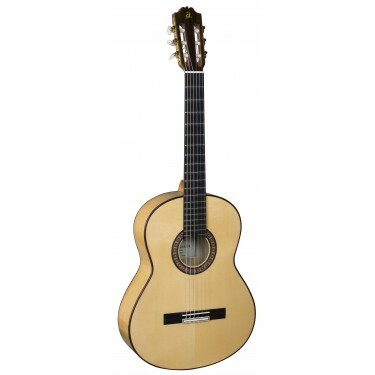 The new guitar Admira F5 is an all solid woods flamenco guitar designed for professional players and advanced students of flamenco guitar music. The Admira F5 is an spanish guitar Made in Spain with solid woods, great craftsmanship, very good sound and comfortable action. The action in the flamenco guitar is a bit lower than the action in a classical guitar and the sound is rich and well balanced with plenty of atack. The flamenco guitar Admira F5 incorporates a solid spruce top, solid cypress body, cedar neck with rosewood reinforcement strip, ebony fingerboard, rosewood bridge, Savarez CJ500 strings and gold plated tuners. Polished finish.